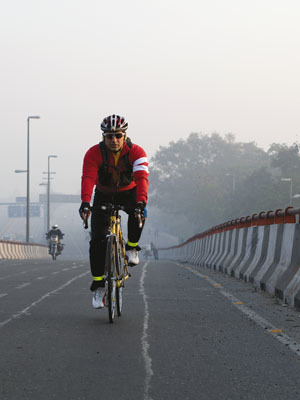 Arun Katiyar and Manjula Sridhar give you the complete lowdown of India's best cycling routes. “A great resource for cycling routes is mrpumpy.net – has descriptions of many routes across the Asian subcontinent, including India. He’s like the Bible for me. -Arun Katiyar, ex-journalist and avid cyclist, also writes a column on cycling for Man’s World magazine. -Manjula Sridhar is an IT professional and triathlete. Hi i am looking for cycling and Indian bike tours,i really appreciate for post very informative information on your blog about bike tours,with the help of your blog i got best visiting place for bike tours in India. Gwalior Municipal corporation has done a tremendous work for cycle riders and for those who walk on road. As the corporation does work to make a separate cycle track and footpath of around 35 km so that due to heavy traffic, cycle riders and walkers do not get that traffic problem at all. This is the first city of Madhya Pradesh who has initiated this work of making separate cycle track and footpath.Gwalior municipal corporation commissioner initiate this work to raise the attention of people towards greenery and to avoid road accidents. I AM IN SEARCH OF A \"CYCLING COACH\". AT PRESENT, I PRACTICE CYCLING AT AHEMDABAD. i am 14 yr old , i love cycling, wants to become a number one cyclist in the world, can u suggest me trainer or coach who wl support n guide me in fulfulling my dreams. i try to apprached many people , i am working hard n ready to work more hard with proper direction, guidance. live in mumbai central area. Any best cycles routes in chennai.I have ordered a new bycycle online and waiting for mine to be delivered from xycles.com and iam also looking out for good route to for cycling suggest me some routes. Also, check out the page www.artofbicycletrips.com They organize cultural and rural bicycle trips for people visiting India. Just a correction on the Goa Cycling Group, it is called Goa Cycling Association & is managed by a Committee of riders including me. No Canadian Woman. I read a comment which said we need foreigners to tell us where to ride in India. If we as cyclists do our research and mark the routes, we do not need foreigners to tell us or show us how to ride. I have been living in Muscat for over 5 years, I lead a group of MTB riders every week, I am also an Indian and live in Goa. Muscat is a mecca for MTB, I have spent hours marking terrains etc here. It is up to the individual to make that effort. I also conduct workshops & training for bike skills etc. How did Gujarat Become a Farming Paradise?